Build a sub with any of these yummy fixings. Check off what you would like frome each category below, then get cooking. Download extra menues on kidstir.com for friends and family, and take orders! Subs are also known as heroes, hoagies, grinders,or even torpedoes, depending on where in the country you live. What’s your name for a sub sandwich? Write it down here! 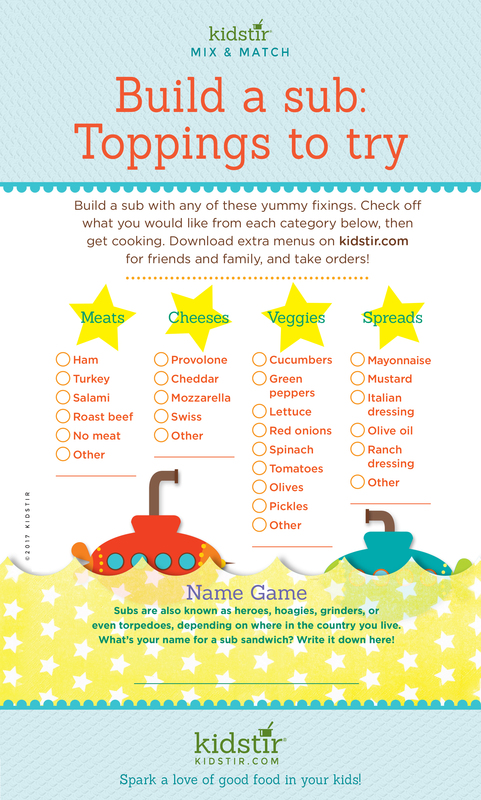 We’d love to offer Kids our “Submarine Sandwich” infographic for you to share on your blog. Just select and copy the code snippet below and paste into your next blog post. 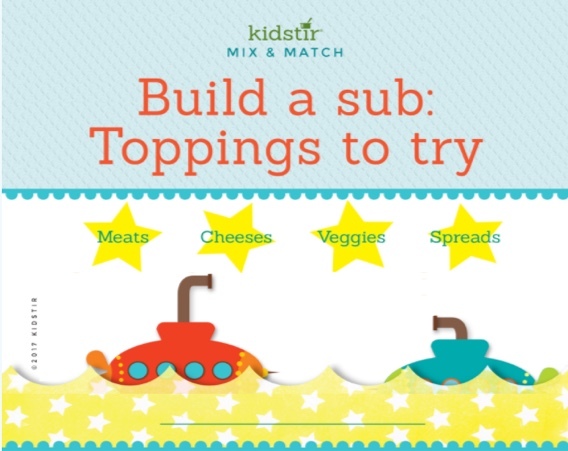 Pack up the fixings for a submarine sandwich and let your kids assemble their own ingredients. Include fillings of your choice like lettuce, olives, tomatoes, and sandwich meat, bring along a small container of mayo and a submarine torpedo roll. Here is a school lunch ideas list which includes the sub. Want more sandwich making ideas? How about 10 creative ways to make a sandwich to keep the sandwich ideas coming. A few of those crazy ideas include using alternate breads like pita bread, crackers, thin rice cakes, English muffins, flatbread or tortillas instead of boring bread. We’d love for everyone to share this page on social media or email using the buttons below so you can share our Kids Submarine Sandwich Infographic!